There's no bigger treat than afternoon tea in my opinion; this year for my birthday my sister treated me to a sumptious afternoon of tea in the fabulous Bar 190, located in the Gore Hotel in London, where I ate the most delicious roasted vegetable sandwiches (with the crusts cut off, naturally) I have ever consumed. 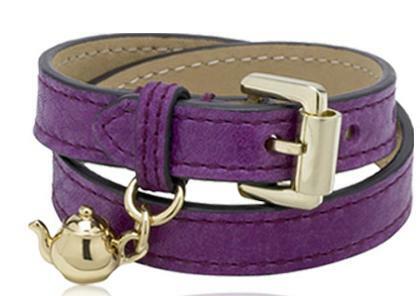 I can't think of a better way to celebrate my love for the British past time of taking tea than to wear this fabulous 'Margaret' leather cuff, complete with adorable teapot charm, fresh out of Mulberry's A/W 10 collection. Priced at £85, this charm allows mere mortals like myself to buy into a bit of that Mulberry magic when an Alexa bag is completely out of the question. Buy your 'Margaret' (named after another British treasure, Princess Margaret) here .